RATO stocks FM-ATV transmitter kits. A design by ON7IZ, they can be used at both 13 and 23cm wavelenght. 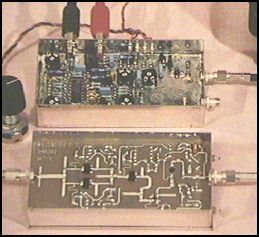 The transmitter consists of two modules: a FM-ATV modulator (ordercode ATV13b) on the one hand, and a PA-amplifier which boosts the signal to 800mW output(23cm) / 500mW output (13cm) on the other (ordercode ATV13c). The ATV13b combines standard video and audio signals, e.g. from a camcorder or VCR, to a 23cm/13cm ATV-FM signaal of around 40mW. If nescessary, this 23cm/13cm signal can be further amplified by the ATV13c PA, resulting in at least a 500mW signal. The PA can also be used for other modes of transmission (e.g. FM telephony, SSB). In the kits you will find all nescessary components, a pre-drilled tinned housing, the PCB and complete assembly instructions. Extensive use of SMD components is made in both kits.